Today, it’s time for another Ask Yoast case study. In this edition, we’ll give SEO advice to a local business owner. We received a cry for help from Hussein Ibrahim who owns the car services site seattletowncarbestride.com. Hussein wanted to know what he could do – apart from using our Yoast SEO Premium plugin – to get excellent rankings for his business in the major search engines. Well, Hussein, here we go! If you want to improve this site’s SEO you have to focus on local SEO. Since Hussein’s business is a car and taxi rental service, he’s bound to a certain area: in this case Seattle. So it’s crucial that his site ranks for people who are searching for these kinds of car services in Seattle. There are 3 main things to keep in mind if you want to rank locally. The first one is adding structured data to your site. It’s important to have schema.org markup on at least your contact page, and you might consider adding it to the footer as well. Yoast’s Local SEO plugin can help you out with the first. It inserts Google Maps into your contact page, as well as your business address and opening hours. In addition to that, you might see this data pop up in the search results pages as well, if Google chooses to use rich results for your site. 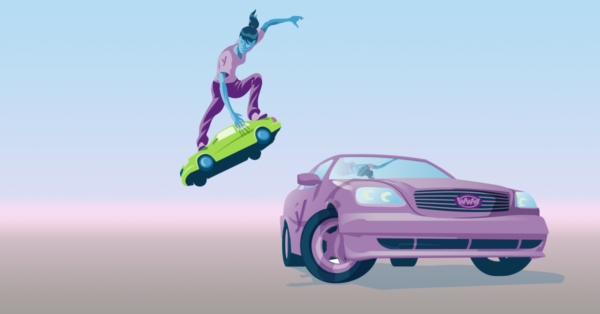 Seattle town car best ride currently doesn’t have any structured data, so we highly recommend to add it to their site! In this article we’ll sum up what to pay attention to, when adding structured data to your local business site. Or learn how to implement structured data to your site with one of our online courses. Additionally, you should let Google know you’re a local business owner by having a Google My Business account. This will help your site show up in the search results when people search for a car service in Seattle. Having this can also lead to rich results in the SERPs, such as a knowledge graph. Make sure that the address listed in your Google My Business account is the exact same address as displayed on your site, otherwise you won’t benefit from having this account. Having ratings and reviews on your site is important to make your business look trustworthy to your visitors. Moreover, it also helps Google determine whether your business is valuable for their users. 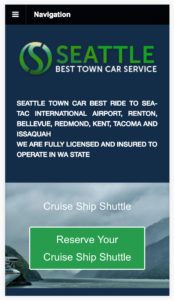 Seattle Best Town Car Service should, therefore, implement a possibility for customers to give a rating for their services or write a testimonial on their site. This is something they can actively ask their customers to do after using their services. Page speed is one of the most important ranking factors for Google, so it’s key to make sure your site loads fast. We did a page speed check for Seattle Town Cars Best Ride and this is what we found. First of all, we’d advise Hussein to take a look at their hosting company. When using the PageSpeed Insights tool by Google, ‘reducing server response time’ was one of the recommendations. This is not something you can do yourself, but it depends on what kind of server your hosting company is offering. If they can’t speed up the response time, consider looking for a better hosting company. Secondly, browser caching should be enabled for all types of files. This is not the case for some JPG and CSS files on seattletowncarbestride.com. Since this site runs on an Apache server, you can fix this easily within the Yoast SEO plugin. You can do this by specifying the expiration times in the htaccess file, which can be edited from within the Yoast SEO plugin. Watch this video to see how easy that is. In case your site is running on an Nginx server, you can ask your host to do this for you. 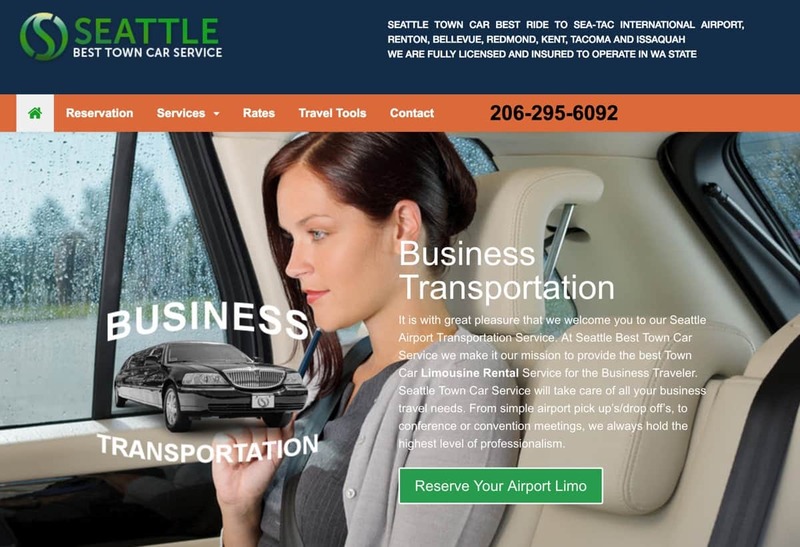 Last but not least, Seattle Town Cars Best Ride should optimize some of the images on their site. A list of the images that need compression can be found in the Pagespeed Insights tool. Compressing images will reduce the file size, which will make these images load quicker. If people work on optimizing their site for search engines, they often tend to overlook user experience. But if your visitors seem to enjoy your site – which Google determines by analyzing so called user signals – this can positively affect your rankings. Google wants to offer the best search results and experience to their users. So don’t forget to always keep an eye on the usability of your site. 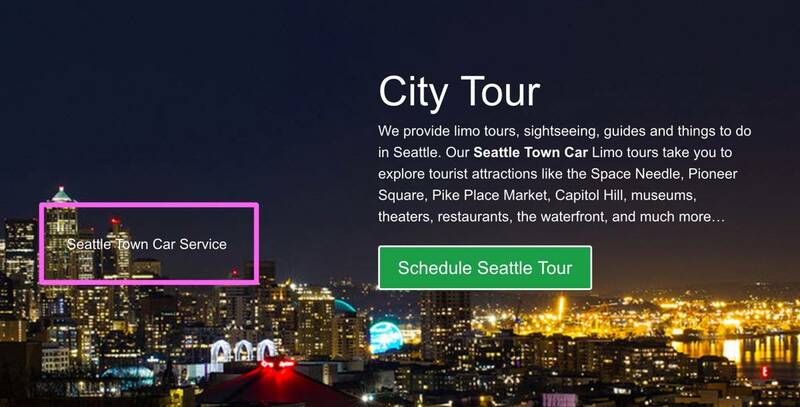 Seattle Town Cars Best Ride has quite some moving elements on their site, causing distraction and possibly negatively affecting the user experience. Especially on the homepage, the moving images get a little annoying when scrolling all the way down. Toning that down will give the site a much more focused and calmer appearance. Also, a slider is used on the homepage. This is something we advise against at Yoast. The most important reason for that, in this case, is that the call-to-action disappears and reappears if the slider changes. This makes it harder for the visitor to get to the page you want them to get to. 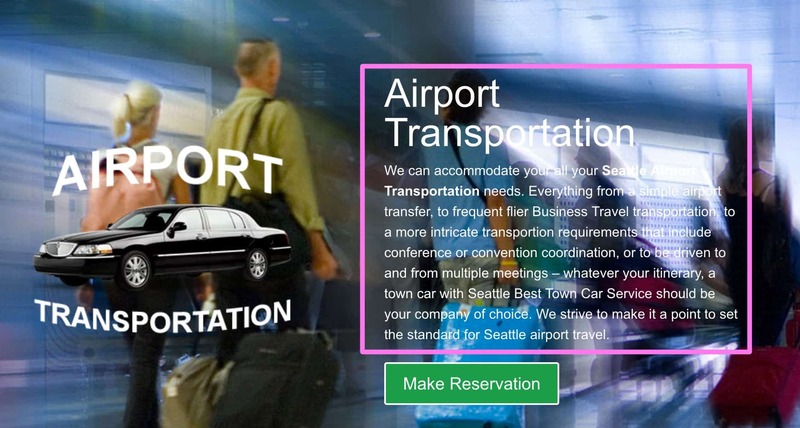 What we like about Seattle Town Car Best Ride is that they have separate landing pages for all the services they offer. That makes it possible to optimize every service for its own keywords. Therefore, their chances of ranking for every service will increase. The service pages also have some decent content which describes what the service is about. Keep in mind that you should at least write about 300 words on a page, to show Google that you really know what you are talking about. Because Google wants to show their users the best search results as possible, you should be able to convince Google you are an expert on that topic. Some pages of Seattle Town Car Best Ride could benefit from some extra attention though. The ‘Reservations’ page and ‘Rates’ page are lacking introductory content. Both can be seen as “thin content” pages by Google, decreasing their chance of ranking. Moreover, the ‘Reservations’ page has little content and a broken contact form. Always make sure that your visitors can reach you, otherwise there’s no point in optimizing your site at all. Apart from visitors that – hopefully – read your content, Google tries to ‘read’ your content as well. Headings play an important role in understanding your content. Seattle Town Car Best Ride uses H1 and H2 headings to structure their text, but it uses the H1 twice on almost every page. Google could find this confusing because it assumes that the H1 describes the subject of the page. If there are multiple H1 headings, Google doesn’t know which one you deem most important. The meta description is another important content element for SEO. A good meta description is crucial if you want to convince possible visitors to click through to your site. With a clear description, you can inform potential visitors what a page is about. Seattle Town Car Best Ride is lacking a meta description on a lot of pages. This doesn’t mean the pages won’t show a description in the snippet in the search results, but Google itself will just pick a sentence from your page – which doesn’t always turn out bad. Sometimes Google will do that, even if you have created a meta description. Nevertheless, we think it is worth your while to write a strong meta description. If Google chooses to show it, it can make your snippet much more appealing. As Google and the internet changes and evolves, so does SEO. A few years ago, most sites were running on HTTP. Nowadays, you see more and more sites that use HTTPS for secure browsing. We encourage site owners to take this step, and so does Google. Google has said that having HTTPS is seen as a ranking signal. Seattle Town Car Best Ride isn’t running on HTTPS yet, so we definitely recommend to make this change. In general, your hosting company can help you switch to HTTPS. Another important development in SEO is Google switching to mobile indexing first. This will probably take place in 2018, as they announced. As a result, Google will rank your site based on the mobile version of your site, instead of the desktop version. Google is doing this because more and more users are browsing on a mobile device instead of a desktop. So having a top notch mobile site should be everyone’s top priority. Fortunately, Seattle Town Car Best Ride looks and works fine on mobile. What they should fix though, is their site’s speed for better performance on mobile, like mentioned above. All in all, Seattle Town Car Best Ride, isn’t doing bad at all content-wise. 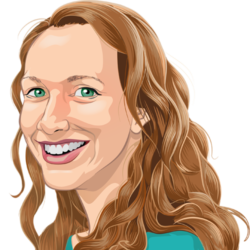 They are clear about what services they offer and make sure that their visitors know how to contact them, by using call-to-actions near every content part. But they could definitely benefit from some local optimization. Adding structured data, creating a Google My Business account, and adding ratings and reviews to their site, makes clear to Google that they are a Seattle business that needs to be taken seriously! I never knew that adding sliders is having affect on users. My sliders were set at every 3 seconds. I thought it will look good to user. But thanks for pointing it out. I am gonna remove it. Thanks for your article. I appreciate the content for google and content for user perspective. The structured data aspect is a subtlety often overlooked. Also, this conversion over to (https:) costs a bit of money depending on hosting. Siteground includes a year SSL certificate in their hosting package. If you know of others please share. Showing cases in practice is a great idea for securing Local SEO content. Congratulations, really. To reinforce you would have link building tips? 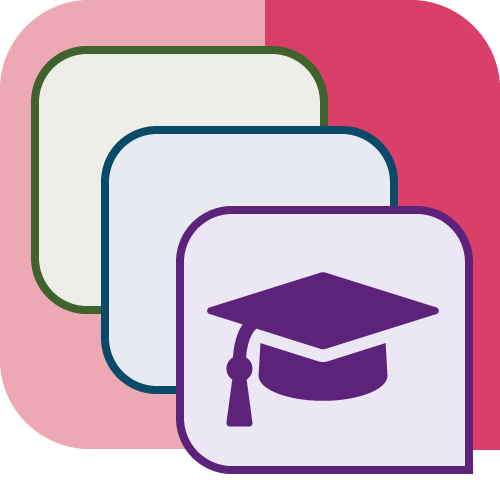 Yoast has a very useful tool related to seo local business. I think very useful to everyone. It’s nice tool.